There’s a famous saying that goes: “There’s nothing certain except for death and taxes.” In reality, they should add a third item to this list: work. Unless you are fortunate enough to be the progeny of Jay Z and Beyoncé, LeBron James, Oprah, or someone else with enough money to allow the next 5 generations of their family to live comfortably, you are most likely going to spend a good chunk of time at work for the bulk of your life. And this is OK. Work is a fact of life for most of us. We all need to make money to fund our lives and support our families. Hopefully you are able to earn a living at a job that you enjoy. But even if you are one of the lucky ones who likes their job, it’s unlikely that you enjoy every aspect of it. It’s called work for a reason. It’s certainly less glamorous than skiing a powder day, seeing your favorite band rock out live, or being a Cleveland Browns fan this past weekend watching your team win for the first time since Barak Obama was president. That’s just a reality that we all must accept. The restaurant industry offers people a way to make good money in a fun environment. That being said, not everything you’ll do during your shift will be fun. There’s a lot of hard work involved in making a restaurant run smoothly, and not all of it is glamorous. Let’s take side-work as an example. Let’s face it – side-work is easily one of the least enjoyable aspects of working in a restaurant. However, it’s also a crucial component to making sure your servers are able to provide your customers with a great experience. Bartenders and servers are incentivized by tipping to provide excellent customer service, but they don’t have the same incentive to invest a lot of energy into cleanliness and preparedness. Great customer service equates to more money for your staff. Side-work, however, isn’t as easily seen as benefiting your employees’ bottom line. And these tasks are also really boring. If you go into the bathroom of a restaurant of and it’s disgustingly filthy, you may be more inclined to wonder about the cleanliness of the kitchen and how your food is being prepared. Conversely, when you see a bar that is very clean and has sparkling bottles, it creates a more professional atmosphere and gives your customers more confidence that their food and drinks will taste great. While it’s one of the more mundane aspects of the job, side-work is still extremely important. 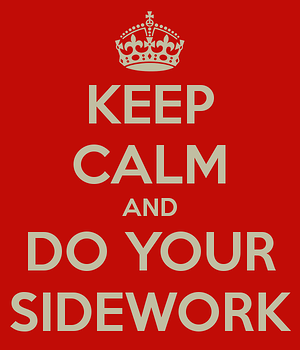 Side-work is basically a “pay it forward” type of task. Your employees are taking care of items that will set the next shift up for success. This is important, and your entire staff wins when this is done well. Everyone benefits by showing up for work with everything prepped and ready to go. Conversely, it can create a toxic environment when things aren’t set up properly when you show up for work. After all, why should you put in the effort to set your coworkers up for success when they don’t return the favor? In bars that aren’t well run, the “screw it” attitude tends to prevail, and it causes your staff to constantly be running around in circles. Tasks that should be relatively quick (such as grabbing a to-go box) are now more complicated (because you have to find them in the storage room instead of at the server work station). This becomes a circular cycle because each time the “screw it” attitude rears its ugly head, it increases the likelihood that other staff members will follow suit. When bartenders show up for a shift to find that everything is in disarray and nothing was prepped for them, they are less likely to take the time to do things like cut extra limes at the end of their shift so that the next bartender will be set up for success. The bars that get the side-work piece right tend to have guidelines for their staff regarding how these tasks should be completed. Most people tend to want to do a good job, so providing them with a checklist or a set of guidelines will often make a huge difference in how side-work is completed. Having a side-work checklist ensures that your staff clearly understands what needs to be done and what is expected of them. These guidelines also ensure that staff who come from other establishments will internalize the unique processes associated with your bar. Every bar does things in their own way, so it’s likely that side-work at your bar is done differently than it was at the last establishment a particular employee worked at. There is often a correlation between keeping everything clean, prepped and organized, and the overall performance of your bar. If your staff can’t take the time to do the little things such as side-work and maintaining a clean restaurant, it’s a lot less likely that you’ll get them to follow all protocol regarding how drinks are poured and making sure everything is rung in properly. One of our clients is a high-volume sushi restaurant in Denver – their weekly sales are often higher than many of our other clients’ monthly sales. The owner of this restaurant has made cleanliness and organization a top priority for the staff. It’s not surprising that this establishment has an accountability score of 98%, which is about 5% higher than our average client score in 2017. There is definitely a correlation between these two items. Improving cleanliness and the way your staff approaches tasks such as side-work is an easy way to start changing your culture and improving your bar’s standards. Ultimately, this can eventually carry over to the way your staff follows standards for how drinks are poured and comp tabs are used. When this change occurs, you will see a significant boost in your profit margin. Ultimately, everything that occurs at your restaurant is a reflection of ownership and management. If something isn’t being done correctly, the question you must ask is, “What do the owners and managers need to do to fix the problem?” This isn’t suggesting that your managers will scrub the kitchen; rather, they need to put a framework in place to ensure the rest of your staff completes these tasks. The first step in improving this process involves setting clear expectations. Your managers need to discuss these expectations with your staff and write them down so that there is a clear record of what needs to be done and who is expected to perform each task. 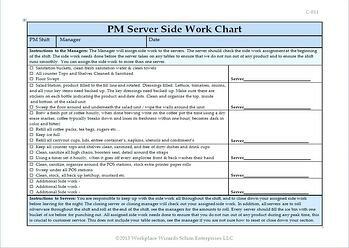 This can even be as detailed as assigning a specific side-work task to each server station. Setting clear side-work guidelines also provides you with something to measure your staff’s performance against. Instead of your manager saying that a particular employee is “lazy” or “isn’t doing a good job,” you will be able to identify specific tasks that your staff aren’t completing. You can then re-frame the conversation by asking your employee: “These are the five side-work tasks you were responsible for. Why hasn’t this task been completed?” By having clear guidelines, you’ll be able to measure your staff’s performance and identify opportunities for improvement. Setup vs. Closing Tasks – Certain tasks make more sense to be done at the start of the day, while others make more sense to be done at the end of the day. Therefore, it’s important to differentiate between setup tasks and closing tasks. Setup vs. closing items can vary based on the specifics of your business. If your bar closes at 2 am, it may make more sense to have some of the closing tasks get completed the next morning as part of the setup process. It’s often easier to get a bartender to come in an hour earlier for a day shift to prep for the day than to have someone stay until 3-3:30 am after a long, busy night shift to prep for the following morning. These are decisions that you’ll want to make with your managers based on what you feel is the most effective way to run your bar. Daily vs. Weekly Tasks – Not all side-work tasks need to get done every day. Some can be completed once a week. However, it’s really easy for these weekly tasks to get forgotten since they don’t occur very often. Having a list of weekly side-work tasks will help ensure these items get done. It’s also a good idea to break these weekly tasks up and assign each one to a different day of the week so that you don’t have one shift that requires a lot of extra side-work. Bar-i has created a side-work template to help you make this process more efficient. We encourage you to click on the link below to access our side-work checklist. Keep it on a single sheet – Ideally, this checklist should be printed on a single sheet of paper so that it’s easy to read. Post it clearly – Post it somewhere visible to your staff. This will allow your staff to refer to the side-work checklist whenever they have a shift. It will also increase the likelihood that everything on the checklist gets done. You should also post it in your bar manual. If you feel it’s necessary, you can take it to another level and have your staff sign off on each item when it’s been completed. This will let your managers know what has been done during each shift and what is left to be done. Customize our Template – Our checklist is a great starting point, but we encourage you to customize it based on the specifics of your bar.